I've been a proud booking.com affiliate partner since 2013, despite more than 4-year experience with this affiliate program, I haven't earned here much (less than EUR 1000). It was around the middle of 2014 (more than 3 years ago) when I did set my first affiliate goal for Booking.com - send 50 or more visitors monthly to booking.com site. At one stage I found that hotel affiliate marketing is a way too competitive, I decided to drop it, but not completely, as time went, more and more bookings happened via my blog, and income generated from booking.com slowly, but steadily started to increase. Technically speaking I reached 50 visitors to booking.com site about 2 years ago, back in 2015. On the other hand, despite the blog has experienced a tremendous growth from just 2,584 monthly users, back in August 2014 (when I set my first goal about 50 visitors/mo) to more than 100,000 users/mo three years later, the total visitors sent to booking.com, hasn't increased the same speed. In fact, the most visitors my blog has sent to booking.com website is humble 364 visitors in June. Back in June, my blog got about 88,000 users. 364 visitors account to about 0.413%. In general, I see two options right now - either to double total blog visitor count or to work with existing numbers, fine tune some existing articles, and push more with hotel related content a little bit harder. I believe some day I will be able to report 200,000 users/monthly to this blog, but it shouldn't happen overnight. Organic, natural way. 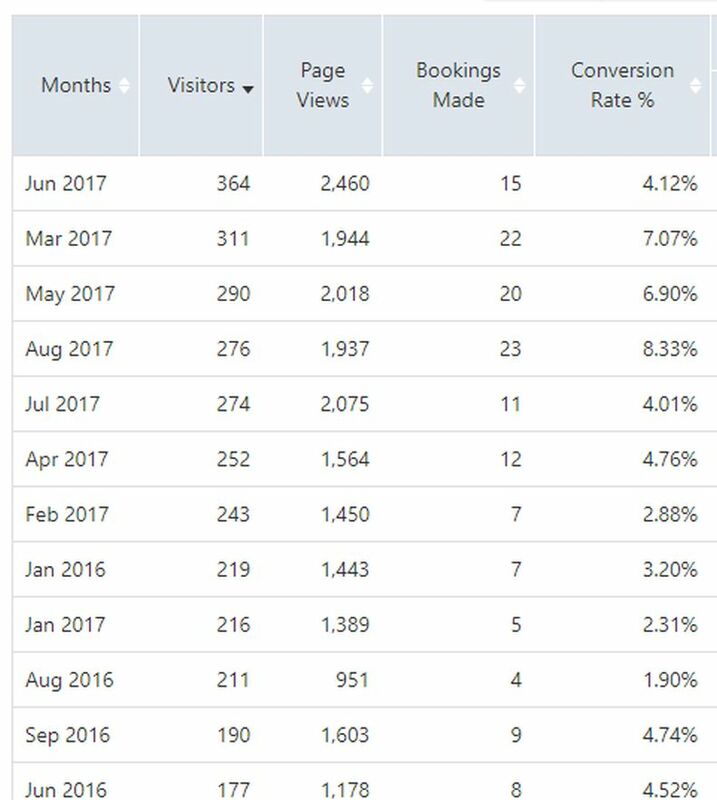 My previous experience shows that the most bookings happen in a Summer months, as of writing this in the middle of September, I see upcoming Autumn, Winter, and Spring is a great time to make more hotel and travel related content, and actually since the end of August, I have been crafting hotel reviews once in a week. Luckily it's not a problem for me to come up with a travel and hotel related content as I travel a lot, there is dozen of planned travel articles from my trips from this year, and there are few huge travel plans for future. Should work. Being booking.com affiliate for years I still see it as a very competitive niche to compete with zillions of great affiliate marketers and booking engines themselves (think Google AdWords), but also, after reaching 100K monthly users I see it is the right time to push harder. Booking.com affiliate for me is a true passive income, I couldn't make my living from it, but I can forward all income to my passive stock dividend income and generate more passive income.